I am a kinesthetic learner by nature and I find that if I take notes during a meeting, the hands-on activity of note taking helps me retain more of what I have learned. 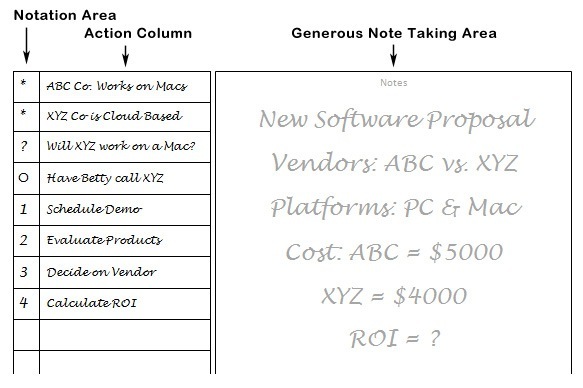 To make note taking even more effective, I’ve done some research into note taking systems and developed a note taking template that helps me organize my resulting chicken scratches into something useful. 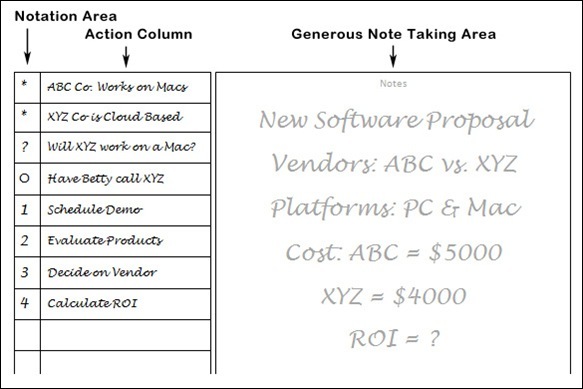 On the right side of the document, there is a generous white space for taking free-form notes. As I follow along in the meeting or lecture, I make notes about major points as they are presented. I usually start at the top and work my way down the document. The white space gives me room to add diagrams, simple pictures, and even flowcharts. Once the meeting is over, I now have a collection of notes, pictures, and notations. This is where my note taking used to end. While this mass of scribbles was sometimes useful, it was easy to forget how things tied together and the document usually wound up being an exercise in futility. But one day I went Hmn… What can I do with these notes to make them more useful? The Hmn was the key… as I discovered Hyatt Markup Notation, a set of special characters designed to make action points out of esoteric notes. This markup language was created by Leadership expert, Michael Hyatt, the former CEO of Thomas Nelson Publishers and popularized by this article on note taking at Lifehacker. To make this work in this document, I use numbers for To-Do items and a regular circle for delegated items. In the picture above you can see an example of my notes from a software proposal session. This template gave me a central one document focus on the project for reference and follow-up. At the bottom of the document is a summary area, where I can summarize my action steps and come to a conclusion. After considering the facts, asking necessary questions, delegating research to others, and performing 4 To-Do steps, I was able to come to a firm conclusion on which software vendor to use. Writing this in the summary box gives me a complete project roundup which can be filed away or three hole punched and kept in a notebook for further reference. 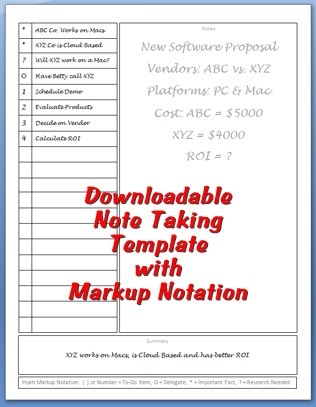 In the zip file, I’ve enclosed a free printable Cornell notes template with a blank note taking area and also one with lines. I’ve included templates for Word 2003, Word 2007, and also PDF versions. 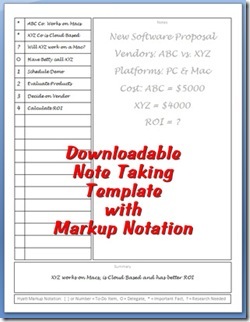 I’ve also included the markup notation at the bottom of the note taking template for reference. This handy meeting notes template should enable effective meeting note taking. Your comments and suggestions are welcomed.